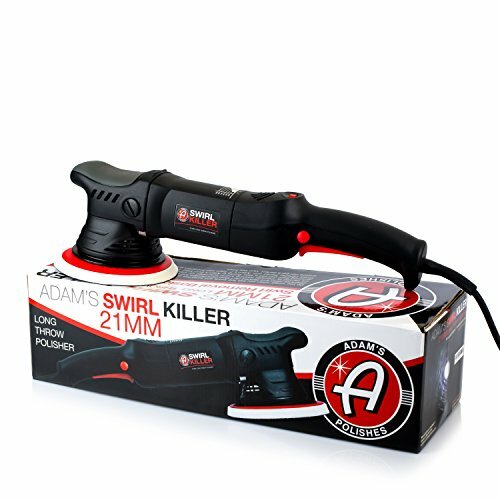 Adam's NEW Swirl Killer 21mm Long Throw Orbital Polisher was designed with our customer in mind. This product has less vibration, reduced long term fatigue, and has been vigorously tested by our team. The soft 25-foot cord makes it a game changer in your garage too. Just like the Swirl Killer 15MM Long Throw, the Swirl KIller 21MM LT also features a soft-start for a smooth and safe start when you pull the trigger. The Swirl Killer polisher has several design features that make it more enjoyable and comfortable to use. The trigger is large, easy to engage, and has a lock mechanism to reduce strain and fatigue on your fingers when polishing for an extended period. The trigger also features a soft start for a smooth and safe start when you pull the trigger. The hand grip above the polishing head is rubber for reduced vibration through your hand and arm. The backing plate has a strong Velcro hook and loop system to keep polishing pads secure during use, but still easy enough to remove the pad without too much effort. The backing plate incoporates a multiple-hole design to keep the backing plate and polishing pad cool during use as well. The power cord is a soft rubber design so that it can comfortably drape over your shoulder while polishing and not twist or tangle as easily. The cord is a longer 25-foot length for easier maneuverability around the vehicle. We have been extensively testing this polisher and now it's time for you to enjoy this affordable, high-quality precision machine too! If you have any questions about this product by Adam's Polishes, contact us by completing and submitting the form below. If you are looking for a specif part number, please include it with your message.